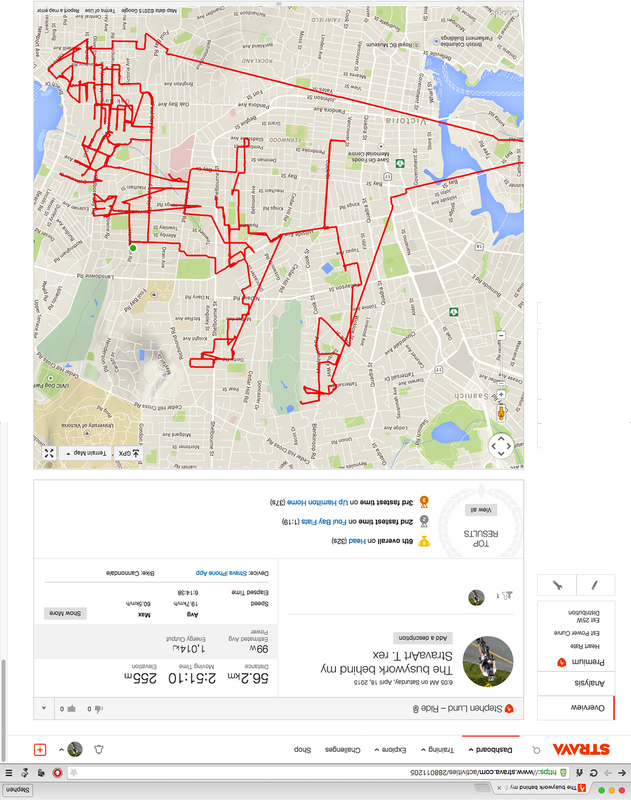 To create 40 kilometres of prehistoric Strava art, Strava doodler Stephen Lund actually had to cycle nearly 100 km. Pictured here is an iPhone Strava app recording of all the mileage that isn’t “captured” in the other image. Where the roads don’t go where my artistic ambitions need them to go, or when I’m determined to achieve a level of detail that simply isn’t possible on the city grid, I exploit the fact that when I stop my Garmin’s timer at point A and turn it back on at point B, I end up with a straight line connecting the two points. It’s a handy trick, but it’s also time consuming. The ride is fitful with stopping and diligent map double-checking to make sure I’m hitting STOP and START at precisely the right spots. And then there’s the added mileage. The recorded distance for my finished T. rex picture is 39.4 kilometres. But as you can see by the data on this image, I pedalled an additional 56.2 km connecting the dots for a grand total of nearly 100 km. To create this “behind the scenes” picture, I simply cycled with two devices – my Garmin and my iPhone. Whenever I pressed STOP on my Garmin I pressed START on my iPhone Strava app and vice versa. This entry was posted in gps art, how to, tips & tricks and tagged bicycling, cycling, dinosaurs, garmin, gps, gps art, how to, strava, strava art, T. rex, tips & tricks, Tyrannosaurus rex, victoria bc. Bookmark the permalink.